Halve but do not peel quinces, then remove pips and core from each with a spoon to make a neat hollow. 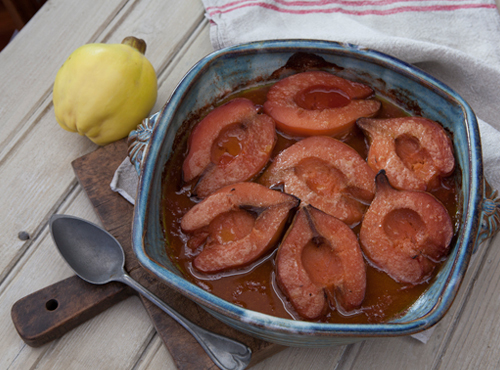 Select a gratin dish that will hold quince halves snugly and grease with a third of the butter. Arrange quince halves with hollows uppermost. Divide honey and remaining butter between hollows and pour water gently around sides. Cover with foil and bake for at least 3 hours until quinces are soft and a rich red. Serve hot or warm with hollows filled with honey juices and offer thick or clotted cream.